At the Elliott House Inn, we love hearing from our guests. 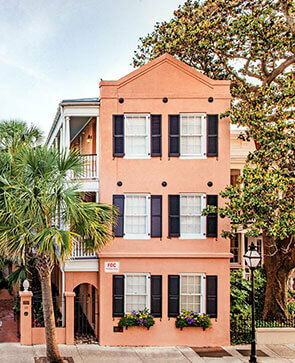 Whether you’re contacting us to begin planning a visit, receive news and special offers, or learn more about our intimate boutique inn in Charleston’s historic district, we invite you to call, email or contact us through the online form below. Take the Meeting Street Exit. Turn right on Meeting Street and travel 1.5 miles to Queen Street. Turn right on Queen Street and The Elliott House Inn is ½ block on the right. Parking garage is located across the street from the entrance to the Inn. Cross the Cooper River Bridge and take the Meeting Street Exit. Turn left on Meeting Street and travel 1.5 miles to Queen Street. Turn right on Queen Street and The Elliott House Inn is ½ block on the right. Parking garage is located across the street from the entrance to the Inn. Cross the Ashley River Bridge (be sure to move to the far right hand lane of bridge), take the Lockwood Boulevard South exit. Travel on Lockwood Boulevard approximately 1.0 mile, Lockwood turns into Broad Street. Follow Broad Street approximately 1.0 mile to Meeting Street. Turn left on Meeting Street and go one block to Queen Street. Turn left on Queen Street and The Elliott House Inn is ½ block on the right. Parking garage is located across the street from the entrance to the Inn.